Breaking ice on the Chicago river EFE. Temperatures have reached as low as 40 degrees below zero in Minnesota, in the Midwest of the USA, as winds from the arctic lay waste to the area. The perceived temperature is said to be around minus 56 degrees centigrade, as over 216 million people in the US are said to be being affected by the sub-zero weather. Whilst polar ice-caps might be melting in places from climate change, exposing land which has not been seen for 40,000 years, 75% of the population of the US is enduring this massive cold spell. 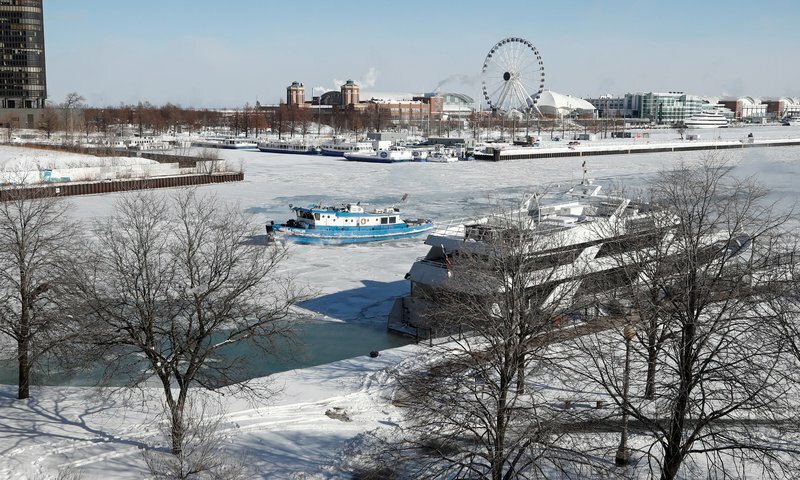 Around the Great Lakes, cities like Chicago are accustomed to a harsh winter, but the “polar vortex” phenomenon, whereby freezing cold atmospheric winds whipped up the arctic make their way to the United States, has left them literally frozen solid. In many places across the country, citizens are being told to remain at home, as even 10 minutes exposure can cause hypothermia.